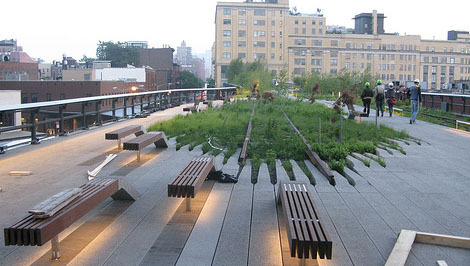 Photography by Jesse Chehak and Paul Schlacter; courtesy of the High Line and flickr. “The High Line was built in the 1930s, as part of a massive public-private infrastructure project called the West Side Improvement. It lifted freight traffic 30 feet in the air, removing dangerous trains from the streets ofManhattan’s largest industrial district. No trains have run on the High Line since 1980. Friends of the High Line, a community-based non-profit group, formed in 1999 when the historic structure was under threat of demolition. Friends of the High Line works in partnership with the City ofNew Yorkto preserve and maintain the structure as an elevated public park. Then the need of public parks in the city and the fear of demolishing this historic structure led to this project.